Maybe Good that Valve Called their API OpenVR? Update, December 6th, 2016 @ 2:46pm EST: Khronos has updated the images on their website, and those changes are now implemented on our post. The flow-chart image changed dramatically, but the members image has also added LunarG. The Khronos Group has just announced their VR initiative, which is in the early, call for participation stage. The goal is to produce an API that can be targeted by drivers from each vendor, so that applications can write once and target all compatible devices. The current list of participants are: Epic Games, Google, Oculus VR, Razer, Valve, AMD, ARM, Intel, NVIDIA, VeriSilicon, Sensics, and Tobii. The point of this announcement is to get even more companies involved, before it matures. Valve, in particular, has donated their OpenVR API to Khronos Group. I assume that this will provide the starting point for the initiative, similar to how AMD donated Mantle to found Vulkan, which overcomes the decision paralysis of a blank canvas. Also, especially for VR, I doubt these decisions would significantly affect individual implementations. If it does, though, now would be the time for them to propose edits. In terms of time-frame, it’s early enough that the project scope hasn’t even been defined, so schedules can vary. They do claim that, based on past experiences, about 18 months is “often typical”. That’s about it for the announcement; on to my analysis. First, it’s good that The Khronos Group are the ones taking this on. Not only do they have the weight to influence the industry, especially with most of these companies having already collaborated on other projects, like OpenGL, OpenCL, and Vulkan, but their standards tend to embrace extensions. This allows Oculus, Valve, and others to add special functionality that can be picked up by applications, but still be compatible at a base level with the rest of the ecosystem. To be clear, the announcement said nothing about extensions, but it would definitely make sense for VR, which can vary with interface methods, eye-tracking, player tracking, and so forth. If extensions end up being a thing, this controlled competition allows the standard as a whole to evolve. If an extension ends up being popular, that guides development of multi-vendor extensions, which eventually may be absorbed into the core specification. On the other hand, The Khronos Group might decide that, for VR specifically, the core functionality is small and stable enough that extensions would be unnecessary. Who knows at this point. Second, The Khronos Group stated that Razer joined for this initiative specifically. A few days ago, we posted news and assumed that they wanted to have input into an existing initiative, like Vulkan. While they still might, their main intentions are to contribute to this VR platform. Third, there are a few interesting omissions from the list of companies. Microsoft, who recently announced a VR ecosystem for Windows 10 (along with the possibly-applicable HoloLens of course), and is a member of the Khronos Group, isn’t part of the initiative, at least not yet. This makes sense from a historical standpoint, as Microsoft tends to assert control over APIs from the ground up. They are, or I should say were, fairly reluctant to collaborate, unless absolutely necessary. This has changed recently, starting with their participation with the W3C, because good God I hope web browsers conform to a standard, but also their recent membership with the Khronos Group, hiring ex-Mozilla employees, and so forth. Microsoft has been lauding how they embrace openness lately, but not in this way yet. Speaking of Mozilla, that non-profit organization has been partnered with Google on WebVR for a few years now. While Google is a member of this announcement, it seems to be mostly based around their Daydream initiative. The lack of WebVR involvement with whatever API comes out of this initiative is a bit disappointing, but, again, it’s early days. I hope to see Mozilla and the web browser side of Google jump in and participate, especially if video game engines continue to experiment with cross-compiling to Web standards. It's also surprising to not see Qualcomm's name on this list. The dominant mobile SoC vendor is a part of many Khronos-based groups including Vulkan, OpenCL, and others, so it's odd to have this omission here. It is early, so there isn't any reason to have concern over a split, but Qualcomm's strides into VR with development kits, platform advancements and other initiatives have picked up in recent months and I imagine it will have input on what this standard becomes. And that’s all that I can think of at the moment. If you have any interests or concerns, be sure to drop a line in the comments. Registration is not required. Yes OpenVR for a standard supported by the hardware makers and games makers that pool their resources like with Vulkan and the other open based Khronos standards for graphics and gaming. M$ and Apple also have to foot the bill for any of their proprietary lock-in while OpenVR and Vulkan will have everybody from phone/tablet makers to PC/Laptop makers supporting via their membership in the Khronos Group a better solution with development costs spread across the entire games/gaming hardware industry. I'll bet after a few months there will be many more names on that list and ARM is on that list so any ARM licensees will benifit downstream by default. 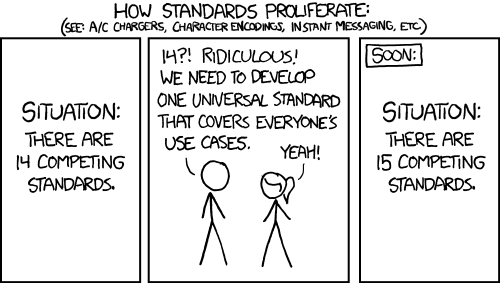 There's a difference between creating a standard that covers everyone's use case, hoping that it will be adopted, and getting the competitors together to agree upon a standard. PDF of slides from Khronos SIGGRAPH Asia 2016! They are responsible for graphics APIs like OpenGL and Vulkan as well as many other smaller but equally significant graphics and compute standards.